Straddling the line between architecture, art and handicraft, Taiwanese artist and designer Cheng-Tsung Feng’s bamboo installations are both monumental and intimate. Large in scale, rich in detail, and mysterious in function, his sculptural constructions invite visitors not only to step inside but also to determine what they are: oversized utility objects, conceptual shelters or unassuming traps? Hand-crafted based on centuries-old bamboo weaving techniques, Feng’s light-weight creations pay homage to a traditional craft that dates back to the prehistoric age while at the same time envisioning an alternative future for it. In fact, Feng also designs bamboo household objects such as tableware, light fittings, and furniture, whose handmade production has been optimized in line with modern industrial manufacturing principles like modelling production and division of labour. Mass produced or one-of-a-kind, utilitarian or conceptual, large or small, it’s the manual labour that bestow upon Feng’s bamboo creations a spiritual dimension that channels the accumulated wisdom of this ancient craft. Cheng-Tsung Feng, Fish Trap House, 2017. 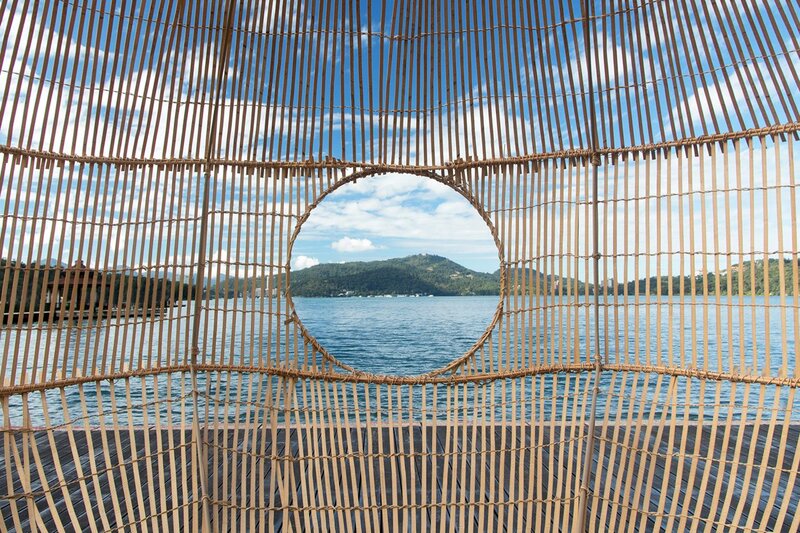 Installation view at Ita Thao Pier, Sun Moon Lake, Nantou, Taiwan. 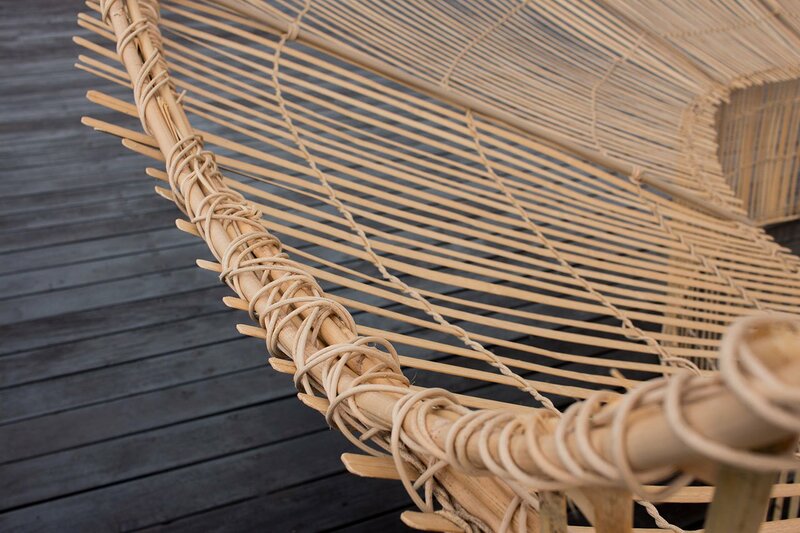 Bamboo, Rattan, Stainless steel, 500x500x330cm. Photo by Chong Sheng Hsu. With hundreds of bamboo species growing across East Asia, the practice of bamboo working is deeply entrenched in the history and culture of the region. Craftsmen in China, Japan and Taiwan have been making utilitarian objects such as baskets, hats, food steamers, tables and chairs for millennia in a rich variety of techniques that have evolved depending - among other factors - on the characteristics of the indigenous bamboo species and the local culture. 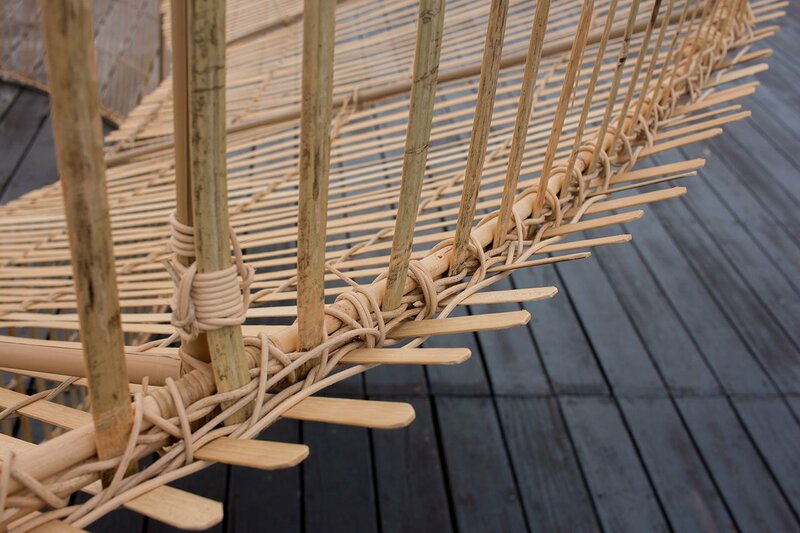 One object that caught Feng’s attention and which exemplifies the regional and cultural diversity in bamboo weaving is the humble fish-trap. Made out of bamboo and rattan, it is an ancient fishing tool that has been used by many ethnic groups in and around the region in a plethora of shapes and sizes that reflect aesthetic preferences, the kind of prey they were designed for, the available materials and the local environment. 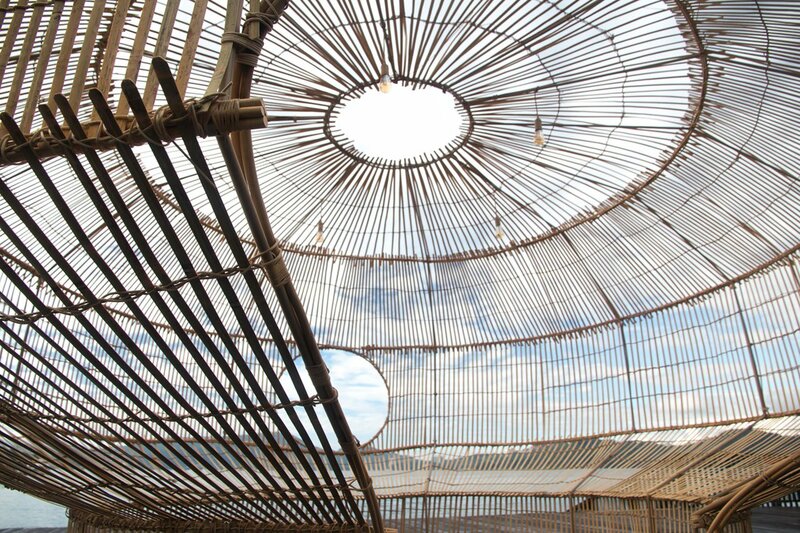 Feng’s research into the history of the East Asian fish trap nevertheless revealed common production processes between disparate cultures, which not only inspired him to incorporate them into his own work, but also confirmed the potency of design as a universal language. In Feng’s hands, the traditional bamboo fish traps have been transformed into Fish Trap Houses that catch people’s attention instead of trapping fish. 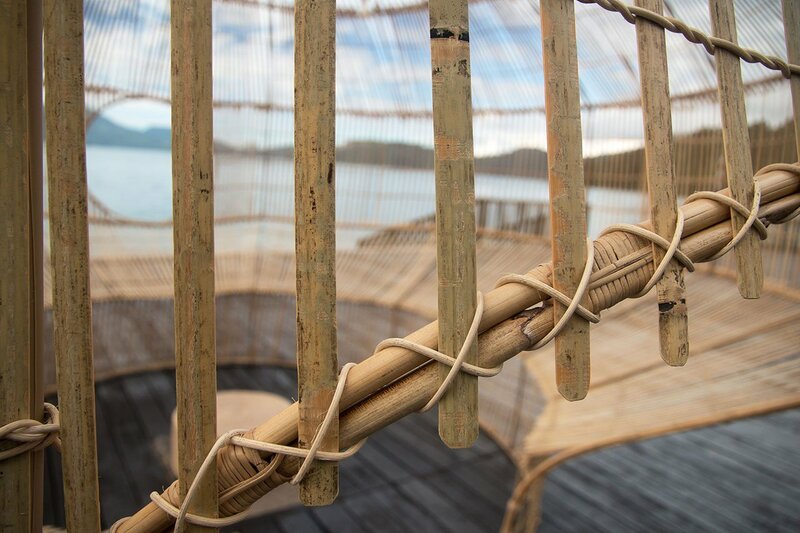 Fittingly, Feng’s first Fish Trap House in 2017 was constructed on the shores of Sun Moon Lake, a scenic landscape in central Taiwan, centred on the country’s largest body of water and home to the indigenous Thao tribe. It was one of the tribe’s elders that taught Fend how to make a traditional bamboo fish trap like those the tribesmen have been fishing with in the lake for centuries. 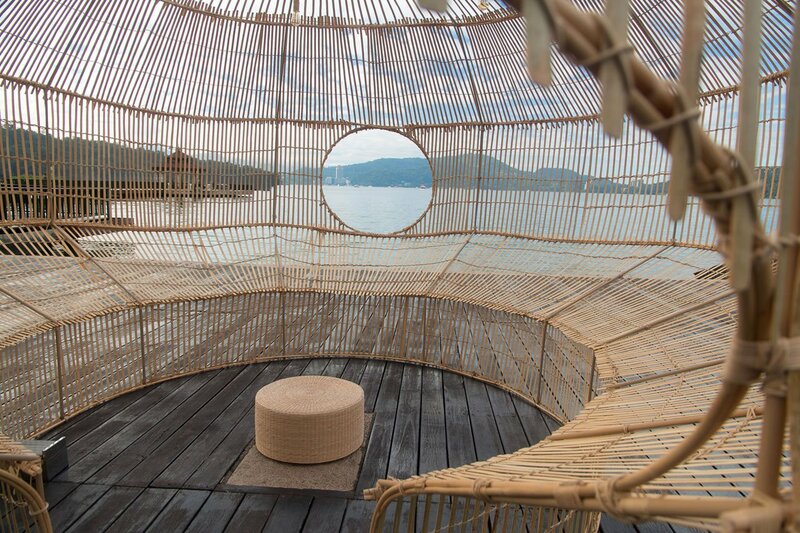 Measuring over 3 metres in height and 5 metres wide, Fish Trap House has a large opening which you can enter inside as well as a circular window framing a beautiful view of the lake that you can enjoy whilst sitting on a bamboo stool. In contrast to the natural landscape of Sun Moon Lake, Fish Trap House II was designed for a very different setting, Shenzhen’s Sea World Culture and Arts Centre in China. Commissioned by the Design Society in October 2018, Feng designed a much more introverted installation as a response to its museum context which was designed by acclaimed Japanese architect Maki Fumihiko. Located in a double height gallery, visitors not only move through the delicate construction but can also watch other people drifting in and out from the balcony above. Moreover, the serendipitous conjunction of Feng’s Taiwanese origins, the architect’s Japanese provenance and the Chinese location, perfectly encapsulates the cross-cultural significance of bamboo weaving which has been flourishing in all three countries for millennia. 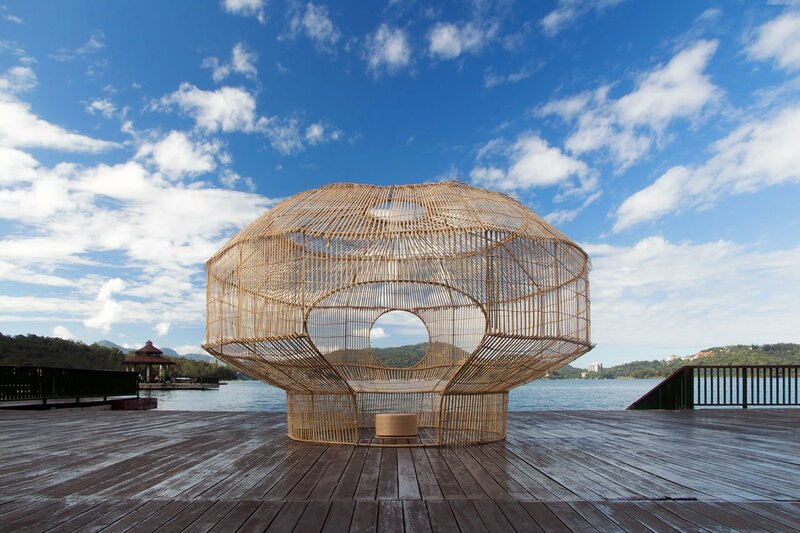 For ‘Beside’, an installation in the Teng Yu-Hsien Music Culture Park of Qionglin Township in northern Taiwan, Feng has swapped fish traps for spheres. 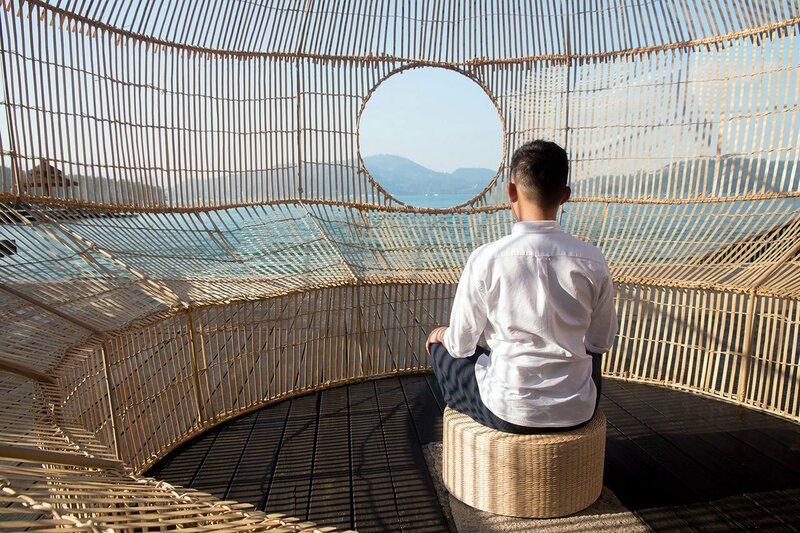 Designed as a permanent space for relaxation, the two spherical constructions have been constructed with the help of 60 local residents who were taught basic bamboo weaving techniques as a way to connect them with the endangered traditional weaving culture as well as establish a relationship with the communal project. 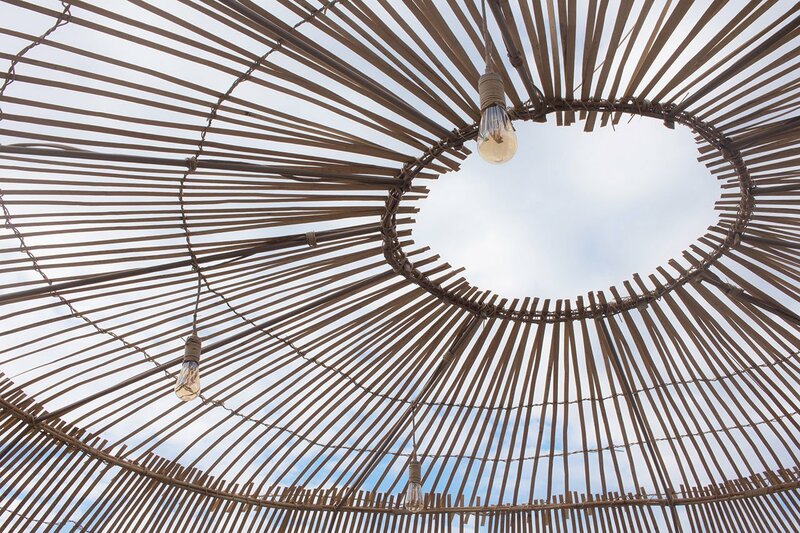 Circular holes of varying sizes, created through a special ‘circle weaving’ process, ensure structural integrity by allowing air to flow through the bamboo volumes while during the night they become sources of illumination courtesy of an internal light source. For Feng, they also symbolize the bonds of inter-generational relationships. Undoubtedly, Feng’s most impressive installation is The Trap, a 20 metres wide, 9 metres high pavilion that was erected around the entrance portico of the Taipei Museum of Contemporary Arts in the Taiwanese capital as part of ‘The Charismatic Rebirth of Yore’ exhibition from May 19th to July 22nd, 2018. 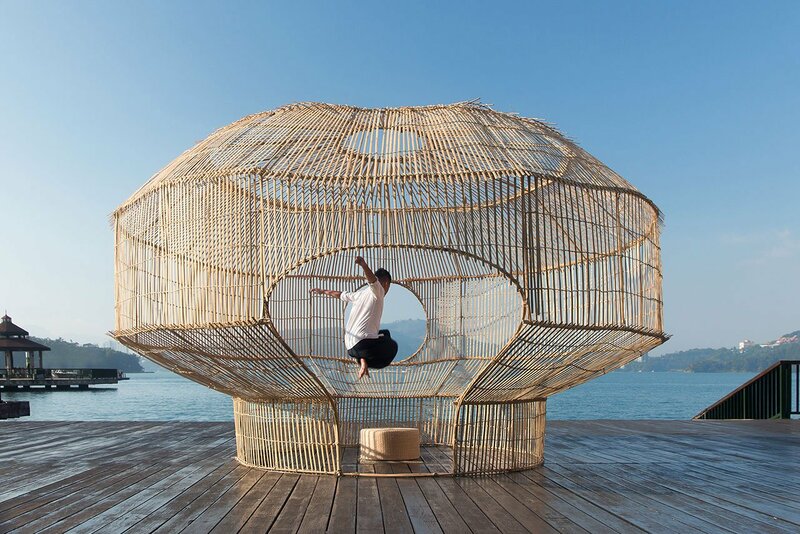 Similarly to the traditional fish trap designs that have been adapting to distinct environments and local prey throughout the centuries, Feng has drawn from his country’s craft heritage to develop a unique design that harmoniously complements the 100-year-old neo-classical building. Gently enveloping the stoud stone portico in supple, light-weight latticework, the installation’s curvaceous form, far from trapping the portico’s rectilinear mass in its bamboo web, seductively augments it, initiating a dialogue between the natural and the man-made, high and folk art, Western and Eastern cultures, tradition and modernity, old and new. It is such dialectical ruminations that impart a poetic aura to Feng’s ethereal installations as well as highlight how sometimes you have to look back to the past to make sense of the present.